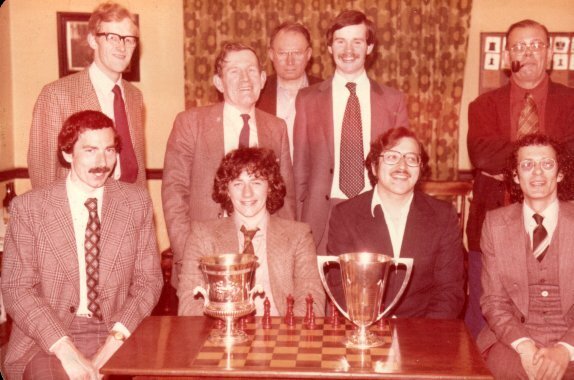 Four ex-caretakers from the Edinburgh Chess Club. 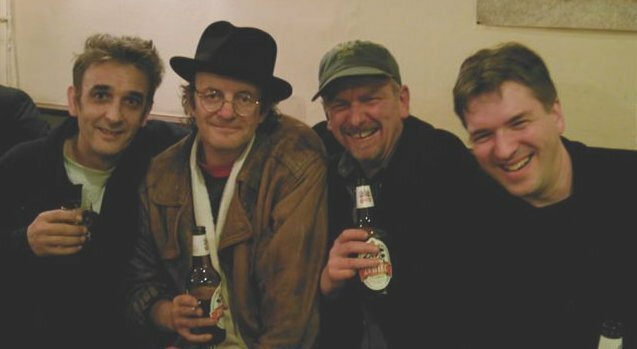 Graham Hamilton, Geoff Chandler, Shaun Harvard, Keith Ruxton. Taken at the recent Dragons Allegro. In a way it's a seasonal photograph. Here we have the Three Wise Men & one other (sorry Shaun). the Englund Gambit. The exchange sac 8 Rxb4. Francesco Rinaldi both point out that 13...Rxa2 is better. Which is just another example of how naff Fritz is. not to sac the Rook and find an improvement. So instead of 8 Rxb4 I found the stronger 8 Nd5. This line is plus for white. Example. This looks better. What do you think lads? the Scottish Chess notice board. White to play. as best play; 1.Nxe4 Kxb6 2.bxa8Q Rxa8. Classing the position as equal. So from the diagramed position the toy wonder missed mate in two. I'm not enjoying this constant raging against Fritz. and wonder why you have started missing tricks. recognition is not registering in your brain. You will become a Stepford Chess Player. 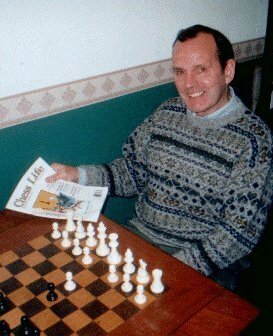 published in Scottish Chess in April 1992.
so I give just wee flavour of the article. Nigerian chess champion, Dominic Nikemeh. where some of the best players in Lagos gather to play BLOOD. Blood is 5 minute chess for a £1.00 stake per game. Gordon then relates an amusing incident. travelling difficulties he faced getting home if he stayed for the end. so he could win some money in the sixth round. Another player offered to play his last round game for Gordon. (recruiting ground here for the Wandering Dragons I'm thinking). One point Gordon touches on was the lack of chess sets in Nigeria. Even in the Bloodhouse they only had two sets between 10 players. Now I've had a couple of emails from Nigeria - don't ask me who. My hotmail account blew up when I did the Tony Miles tribute. I received in access of 700 emails from all over the world. Hotmail thought I had been spammed big time and trashed 80% of them. So if any Nigerian chess player is out there then email me. in Bells and we will send you a standard tournament set & board. In return you mail me a game and a picture from the Bloodhouse. article in the 'Scotland on Sunday' by Dougie Bryson. 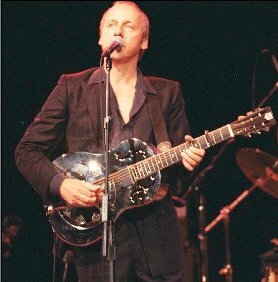 brothers, Mark and David Knopfler! Sultans of Swing, Walk of Life etc. Dougie then found an E.Knopfler game v I. C. Kirkwood. played in the 1953 Scottish Championship. but I found it. In this position with Black to play move 29.
black a mighty pawn on the seventh and should not lose. served on the Parole Board for Scotland from 1994 to 1997. So these two met over the board in 1953. One was the father of a rock and roll duo. Interesting and well researched by Dougie. 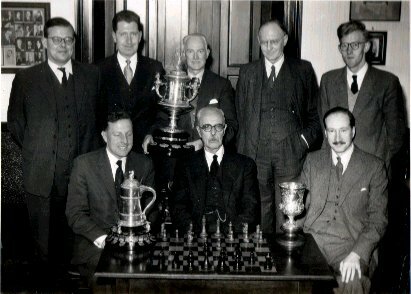 team that won the Richardson Cup for Edinburgh in 1958.
again in the 1982 Richardson Cup winning team. Look at the lapels on that suit. I got married in that suit. Here is an W.A. Fairhurst game. W.A. won the Scottish Championship 11 times. against a young Bent Larsen. who always told truth...Straight Larsen. Demark at archery in 1954 Olympics. Arched Larsen and Bowed Larsen. 24 Bxe4 but 24...Re8 or 24..Bh3 gave Black counter play. with 27...Qxf2 cannot be stopped. A good game.